The Indianola Park Dance Pavilion as it appeared in the 1920s. From raccoon coats to streaking, the University District has always been a welcoming spot for the latest fads. 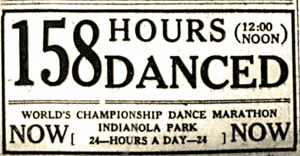 In the late 1920s, the fad sweeping the nation was the dance marathon and it found a home here at Indianola Park. Dance marathons started as a college stunt. Groups of college students would gather and vie with each other to dance as long as they could, with the last couple standing winning a cup or small cash prize or just bragging rights. Dance marathons quickly evolved into something else. They became a kind of mass entertainment with promoters, rules, referees, emcees, personalities, fans, and well-documented records to beat. The nearest contemporary analogue would be a modern reality show contest. Contestants engage in a grueling, physically demanding competition. Promoters emphasize the contestants’ personalities and personal histories. There are good guys, bad guys, lovers, big city and small town couples, the local kids, the rubes, the clowns, the soldier and his girl, etc. Fans are encouraged to identify with their favorite competitors and cheer them on to victory. An emcee turns up the drama. Mass media is used to turn the contest into a big event and bring the crowds back night after night to root for their heroes. Special events and hellish challenges vary the routine. The difference between a dance marathon and a season of Survivor is slight. By the late 1920s, dance marathons were big business. Thousands poured into venues and laid their money down to watch the dancers go through their torturous paces. 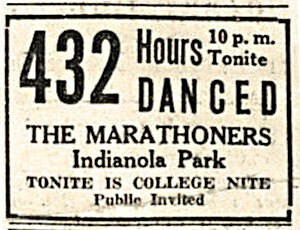 The University District’s first big dance marathon was held in the dance pavilion at Indianola Park on N. 4th St. and began on Monday, January 7, 1929. Indianola was a venerable amusement park that had opened back in 1908. The heart of the park was a dance pavilion with a 20,000 square foot hardwood dance floor. The event was organized and promoted by R.M. Edwards, a Miami-based showman who was one of the leading organizers of dance marathons nationally. Golden-voiced Phil Murphy, a well- known dance marathon emcee, was the voice of the competition. Edwards and company hit the new medium of radio and blitzed the city’s three daily newspapers and the university’s student paper with ads and promotions leading up to the competition. “A 24 Hour Circus” was promised. “The most fascinating sport of the era!” “Nothing like it ever before!” Audiences were teased with the possibility that they would see a new world’s record set. Edwards’ World's Championship Dance Marathon offered five cash prizes: $100 ($1,363 in 2013 dollars) for 5th place, $200 for 4th ($2,726), $300 for 3rd ($4,089), $400 ($5,452) for second, and $1,000 ($13,630) to the last standing couple. Given that an average worker in manufacturing in 1929 made only about $1,400 a year, the prizes were generous. In addition to prize money, couples might win small cash prizes for talent shows during the marathon and could count on anywhere from a few dollars to several hundred dollars in floor money, coins thrown by audience members to their favorites. Couples might further augment their earnings by winning sponsorships from local businesses. 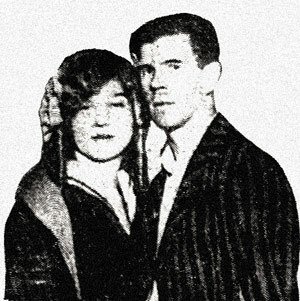 Favored couples could also bank some cash by selling autographs, photos, and souvenir booklets to fans. Rules were simple. Once the marathon began, couples had to be continuously moving the entire duration. They didn’t have to actually be performing dance steps though. Most just shuffled around in a small circle. A couple that stopped moving and didn’t start again within the floor judge’s count was out. A couple or member of a couple who went to the floor had a 10 count to get back up or they were out. Contestants had a 15 minute rest break every hour but otherwise were always on the floor, always moving for the duration of the contest. Management reserved the right to change the rules and randomly introduce physical challenges, stunts, shortened or eliminated breaks, etc. as it deemed necessary to thin the herd or juice up the excitement for the audience. Floor judges, sour-faced solons who ruthlessly enforced the contest rules, were among the villains in the dance marathon show. Audiences loved to hate the floor judges when they tried to rule a beloved couple out or turned a blind eye to the heel couple’s shenanigans. Wary of public outcry, the contest sponsors took good care of the dancers physically. Male and female dancers had separate shower, changing and rest areas. Indianola was perfect for an event like this because it already had men’s and women’s locker and shower facilities (for the pool) and an on-site restaurant. Dancers were fed eight times daily—three meals and five snacks. Additionally, a nurse was on duty 24 hours a day with ice, hot water bottles, aspirin, and advice to ease the dancers’ discomfort. A doctor (from the Ohio Penitentiary downtown) was also on call in case anything serious happened. At 9 pm on January 7, thirty couples began dancing. Several of the couples were Ohio State fraternity and sorority pledges ordered to compete in the marathon as part of their organizations' Hell Week activities. There were also many local couples, taking a shot at winning fame and fortune and maybe a trip to Hollywood. About a third of the couples were professional marathon dancers who traveled from event to event. Heading up the pro contingent were Callum Villiers and his partner Violette Kahl, from Minnesota. Villiers wore a jacket emblazoned with “THE CHAMPION.” Villiers and Kahl had just set the world record of 1,448.5 hours in a previous marathon. The pavilion was open 24 hours a day during the event and spectators came and went at all hours to root on their favorites. Admission was 25¢ from 5 AM to 5 PM and 50¢ during the busy hours of 5 PM to 5 AM. Popular dance marathon master of ceremonies Pete Murphy was on hand to work up the crowds and put the hoofers through their paces. WCAH (the future WBNS) radio did live remotes from the hall. Daily ads in the newspapers and occasional articles chronicled the hours the contestants had racked up and the latest doings at the marathon. The marathon was especially popular with two groups. College students, with an abundance of free time and a spirit of adventure, flocked to the marathon at all hours but particularly in the late evening. Housewives, seeking a break from their routine, dominated the mornings and afternoons. The largest crowds came in the early evenings and contained men and women, old and young, factory and office workers. Dance marathons were called “the poor-man’s nightclub.” For about the price of a movie, attendees got live music; thrills, drama, and pathos; musical, dance, and comedy bits; and the fun of cheering for their favorites. If guests felt like dancing themselves, the park cordoned off a quarter of the ballroom floor to accommodate them. The marathon organizers were always looking to change things up and add interest to the proceedings. Outside comedians, dancers, and singers were brought in for entertainment some nights. Talent shows featuring the contestants were held. Local dancer John Birch showed his dance floor stamina to be matched by a fine singing voice. Dancer Elmer Dupree impressed with his clowning. Brutal endurance tests and stunts were also added to the mix. On February 15, the Friday after Valentine’s Day, the marathon staged another audience attention-grabber: a mock wedding with all the frills for dancing lovebirds William Waltz and Dorothy Duncan. Their budding romance had been one of the marathon’s chief narratives. Emcee Phil Murphy officiated. After the first 48 hours, couples started dropping from the contest at a furious pace. By the two-week mark (336 hours), only 7 couples of the original 30 remained. Just shy of the three-week mark (504 hours), it was only 6—five professional couples and one local pair. In a surprise to all, champion couple Villiers and Kahl were the next to fall asleep on the floor and be eliminated. Then Elmer Dupree was disqualified after striking his dozing partner in an attempt to wake her. On February 16, the morning after their mock wedding, sweethearts Waltz and Duncan were unable to go on. A few hours later Sleepy Time Gal (so called for her uncanny ability to sleep while dancing) Ellen Smith and her partner Yores Raymond drifted off to Dreamland. Marie Rice and Roy Gibson, winners of the World's Championship Dance Marathon at Indianola Park. For another week, local kids John Birch and Jerry Thompson tread the now lonely dance floor alongside pros Roy Gibson and his sassy blond partner Marie “Goldilocks” Rice. Both couples were nearing the end of their physical endurance and remained standing and moving only by sheer force of will. Each suffered repeated close calls when they were nearly counted out. Returning to the dance floor after breaks became like the torment of Sisyphus. Crowds thronged the ballroom as never before to be there when the next-to-last couple collapsed. By midnight Saturday night, the end seemed very near. Both couples were in agony, zombie-like, straining against 1,157 hours of weariness to somehow stay upright and keep moving. It was decided—out of mercy for the dancers—to end it quickly. Judges implemented a 15 second rule. Whichever couple stopped moving around the floor for longer than 15 seconds was out. The couples were barely moving so it was thought it would all be over in an hour or so. Incredibly, they rose to the challenge and kept going another 8 hours. It finally ended at 8:02 AM on Sunday, February 24. Returning from their break at the end of the 7 o’clock hour Birch and Thompson were wrecks, barely able to struggle onto the dance floor. As a crowd of hundreds that had hung on through the night watched, the local kids finally collapsed under the weeks of weariness and were counted out. Gibson and Rice had won. The final two couples had lasted 48 days, 11 hours (1,163 hours). Winning couple Gibson and Rice carried off the $1,000 first prize, plus a $270 bonus, and nearly $100 in floor money. Popular second-place finishers Birch and Thompson did almost as well, making up in floor money much of the difference in prize money. 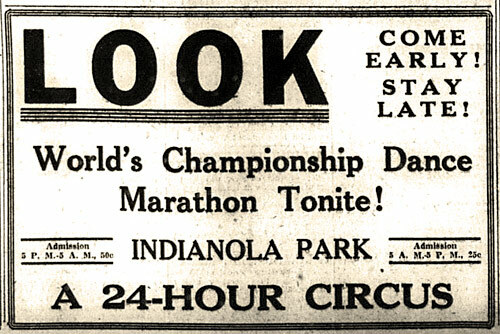 The 1929 marathon was such a success that Indianola Park did it again in April 1930. As for dance marathons themselves, their peak years lay ahead in the early 1930s. After about 1932, though, they went into a sudden and irreversible decline. Scores of shady operators entered the business and burned over venues, contestants, and audiences. Audiences wearied of the increasingly scripted and choreographed events that had come to seem more like a play than a contest. Moralists attacked the events as akin to Roman gladiatorial combat and authorities across the country initiated bans on what they viewed as an unseemly entertainment that trafficked in human suffering.